For 2015 our art association has once again managed to attract three big international names on the international contemporary art scene to Munich for a joint exhibition project. Under the title VICTORY IS PEACE, a selection of works will be presented by Peter Kennard, Eugenio Merino and Jonathan Hobin. What unites the British political activist and photo artist, the Spanish sculptor and the Canadian photographer is their critique of prevailing conditions and their interest in provocation and black humour. In a time in which art is relegated increasingly to being a mere parade of decorative objects or serves only to perpetuate the existing status quo, these artists use the reach of their creativity in a positive sense, bringing important social issues into the public consciousness. Their works combine creativity with protest and show that art should be more than just the icing on the cake for the world’s super-rich. In a world dominated by the classic network of old-boy connections and favours that guarantee an unimpeded career in the art world, they are getting out their scissors and placing, in the words of Merino, their “fingers in wounds that others wouldn’t touch”. 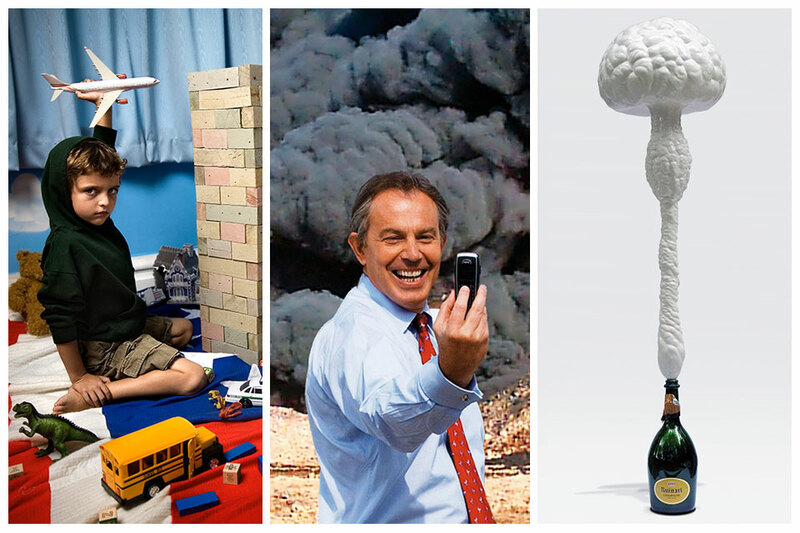 VICTORY IS PEACE presents artworks that the observer understands without firstly having to read pages of theoretical discourse: the former British Prime Minister Tony Blair, proudly grinning for a selfie in front of burning oil fields in Iraq. A torture scene from Abu Ghraib, showcased within the context of the paradisiacal world of a child’s bedroom. Or Merino’s religious-satirical sculpture “Stairway to Heaven”, which depicts the relationship between Islam, Christianity and Judaism as an acrobatic feat. The concept of “l’art pour l'art” is no longer in keeping with the times. On the contrary: art should not entertain the observer. It should shock and cause a reaction, enabling a critical and visionary opening up of realms of experiences and perspectives. This is why Positive-Propaganda shows artists who have a genuine concern, beyond the hyperventilating art market. VICTORY IS PEACE presents art not for art critics, but for everyone. Opening times // Tuesday 10th – Sunday 15th of February, 3°° – 8°° pm | Admission is free.